I have rarely enjoyed documentaries. While some have sparked my interest (namely Super Size Me, March of the Penguins, and a few vegan diet docs my dad showed me), I have largely ignored the genre because of its tendency to explore depressing (albeit important) topics while rarely offering a potential solution to the problem or issue being discussed. Therefore, I am happy to say that This Business of Autism is not that kind of documentary. While it explores an emotionally charged subject (the autism spectrum and the lack of legitimate, long-lasting employment options for those on it), it does so with care, understanding, and acknowledgement that, despite the difficulties faced by this group, it is possible for them to find meaningful employment in Corporate America. However, the most important distinction of This Business of Autism from other documentaries on the subject is that filmmaker Stephen W. Mackey actually interviews individuals on the spectrum, allowing audiences to hear what they gain out of the experience. As someone on the spectrum, this is the first film I’ve seen that communicates the frustrations of job-hunting as well as the sense of joy and accomplishment I felt upon being hired. 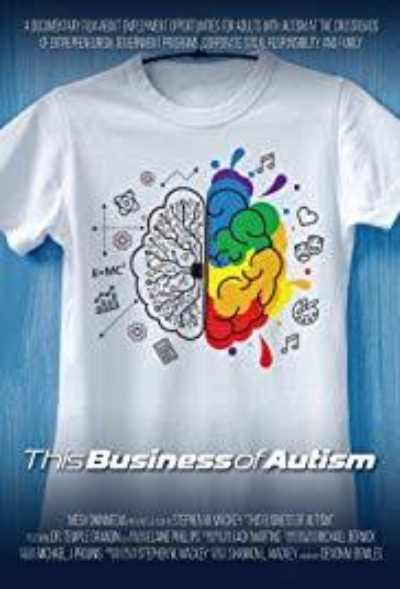 We follow the inception and growth of Spectrum Designs, a T-shirt manufacturing company conceived by “autism moms” Stella Spanakos and Nicole Sugrue, along with then 18-year-old (now CEO) Patrick Bardsley as an opportunity to provide individuals on the autism spectrum with meaningful and empowering employment opportunities. Forged by experience raising and/or spending time with children on the autism spectrum, these three took their idea and slowly grew it to be one of the largest employers of autistic individuals currently running, with 75% of their employees being on the spectrum. Mackey also interviews politicians working to improve disability employment rates along with leaders of programs across the US who prepare autistics for the workplace. This culminates with Spectrum Designs expanding beyond T-shirts into Spectrum Bakes (a culinary facility) and Spectrum Suds (a laundry service), operating with most employees on the spectrum. This Business of Autism is the first documentary on Autism I’ve seen that left me feeling hopeful about the future. While it doesn’t shy away from the hardships experienced by both autistic individuals and their families, it also shows how those hardships made them stronger as a result. Spectrum recognizes the benefits of autism, from attention to detail, perseverance, and (I’m sure to the glee of employers everywhere) a desire to go to work. The interviews with employees on the spectrum in tandem with those of their parents and neurotypical friends make for an unexpectedly well-rounded film that leaves you satisfied and inspired. I spoke with Spectrum Designs’ Chief Operating Officer Tim Howe after a viewing of the film and a reception at the US Capital Visitor’s Center. Howe assured me that Spectrum hires individuals for a variety of positions. The company has since expanded into a culinary facility (Spectrum Bakes) and laundromat (Spectrum Suds), washing away my fear that potential employers would see the film and think, “man those autistic kids love folding T-shirts”. This Business of Autism is an inspiring journey of perseverance through adversity. Through interviews with families, managers, and individuals on the spectrum, Stephen Mackey presents the most comprehensive, yet easily digestible portrait of the employment landscape for those individuals to date. I highly recommend you see This Business of Autism, regardless of whether you know someone on the spectrum or not. This is one documentary you truly don’t want to miss. See it now on Amazon, Itunes, Vimeo, or GooglePlay, and check out the film’s website at www.thisbusinessofautism.com.